America’s coal mining industry has cooled down in recent years. It lost over 200,000 jobs between 2014 and 2016; the latest sorry statistic to cap what’s been a massive downward trend for decades. Expounding on his plan to restore the industry in the “America First Energy Plan,” Trump has promised increased fossil fuel production and environmental deregulation. 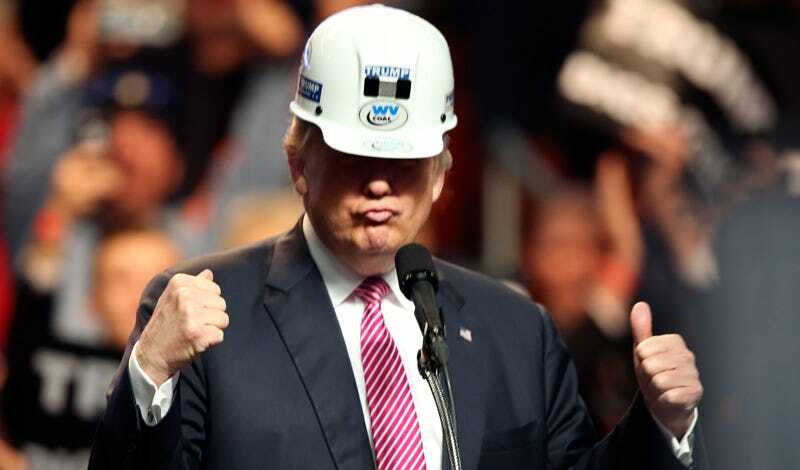 He’s also committed, time and again, to an obscure and speculative technology called “clean coal,” which, in his mind, probably sounds like a win-win for jobs and the environment. Policy and environmental experts, however, say it is neither. CO2-EOR is a potentially symbiotic system, but there are major obstacles, the first one being the up-front cost. “The cost of CO2 capture is quite high,” Xiaoliang Yang, the Carbon Capture and Storage (CCS) project lead for the World Resource Institute’s Climate Program told Gizmodo. The Center for Climate and Energy Solutions estimates the cost of CO2 capture and storage in a coal-burning plant is about $36 per metric ton of CO2. A 2015 study from Carnegie Mellon says CO2 sells for about the same, $36 per metric ton. The only way to offset the capture cost is the aforementioned EOR process. The US began commissioning research on oil recovery in 1989, with companies focusing on using propane and methane gases before carbon capture breakthroughs in the mid 1990s. Carbon capture killed two birds with one stone; reducing climate pollution and offering additional oil-extraction opportunities. The Department of Energy estimates that oil from enhanced recovery projects is recoverable at about $87 a barrel. But both Yang and the Carnegie Mellon study emphasize the amount anyone’s willing to pay for CO2—and whether folks are willing to do EOR at all—depends entirely on the price of oil, which is volatile. This leads to the second, and perhaps largest, obstacle to CCS: the recent boom in cheap natural gas. Trump has said he wants to expand fracking, which increases oil and natural gas reserves, to federal lands. Fracking has lead to an abundance of oil and natural gas, greatly driving down the market price. Since CCS profit margins are pegged to the price of fossil fuels, this begs a question: why would companies use stored carbon to retrieve oil from depleted fields when oil is already abundant? Trump’s own plan to increase oil abundance threatens the profit motive that could lead to the creation of new CCS plants. New CCS plants are also very expensive. The Obama Administration allocated $3.4 billion for CCS research and development in 2009, including funding for commercial CCS projects. For instance, $190 million in federal grant money went to the $1 billion Petra Nova project in Texas, and $382 million has gone to the Southern Co.’s $7 billion Kemper Project plant in Mississippi (which is running two years behind schedule). Does Trump’s clean coal plan involve retrofits, or further subsidizing costly new plants? He hasn’t been clear. Coal is already more expensive than oil and natural gas, and clean coal production only exacerbates the cost difference. That’s the inherent gamble of clean coal plants. Any company building a CCS plant today is essentially betting on how much oil will sell for a few years down the line, when the plant becomes operational. If Trump wants more companies to believe it’s worth their money to invest in clean coal, he’ll have to come up with some way of ensuring that competition from fracking won’t invalidate CCS technology. That leads to the final major obstacle to widespread utilization of clean coal technology: Trump himself. With clean coal so expensive, the only way to motivate companies to pursue it is with aggressive climate policies that penalize carbon emissions. Yang suggests that a carbon tax, which has strong Republican support, or a carbon trading system, as exists in China, could incentivize clean coal. Trouble is, Trump has supported neither. Instead, his energy plan focuses on extensive environmental deregulation, including dismantling Obama’s Clean Power Plan, which aims to restrict power plant carbon emissions. Scaling back regulations will only discourage clean coal. After all, why try to keep carbon emissions within regulations, when those regulations are being undone? There’s little indication the current market climate or political climate will support costly clean coal innovations, even as our president trumpets coal as a job creator. More likely, the clean coal push is pageantry to sway out-of-work coal miners while scaling back Obama-era regulations in order to enrich fossil fuel companies. It’s great news for the fossil fuel companies, but misleading for the folks who voted Trump into office.